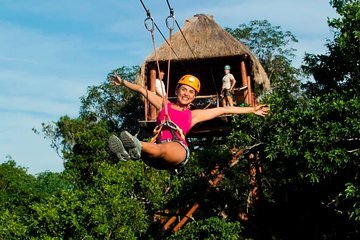 Check off four thrilling adventure activities in one tour with admission to the Jungle Maya Park. Drive through the jungle in a 4x4, fly through the treetops on a zip-line, rappel into a cenote, and swim and snorkel in an underground river. Lunch is included. Make your own way to the Maya Jungle Park, around 15 minutes drive from Tulum, in time for a 9am, 11am, or 1pm departure (depending on option selected). After meeting your guide, hop aboard a 4x4 and set out on a thrilling drive through the jungle. Stop off along the way to explore the world’s longest underground river; swim and snorkel in the Nohoch Nah Chiich cavern; and rappel down a 40-foot (12 meter) cliff into the Yaxmuul cenote. After cooling off with a swim in the cenote, get your adrenaline pumping again as you ride a zip-line through the treetops. Finally, learn more about the region’s rich Mayan heritage as you take part in a traditional Mayan blessing ceremony. Your experience ends with a hearty lunch, including soup, chicken, vegetables, rice, beans and hand-made tortillas. At the end of the tour, make your own way back to your hotel.